I know, I know. Who does a post on the beach the second Autumn begins? Me for two reasons. First is I live in Dubai and Autumn doesn't exist here. It's beach weather until December, so pretty much all year round. Second, I'm going to the Seychelles for 5 days so this is as much as a reminder to myself as ya'll reading this. So here are a few of my beauty related essentials I like to take with me. I do laser hair removal treatments on my face, so It's important to protect the area as much as humanly possible, hence the SPF 100. Sunblock is an essential for me on a day to day basis, and I've found that this one from Bioderma is great as it's waterproof and doesn't break me out. I'll use this all over my face and neck before heading out, and pop it in my beach bag for reapplication. I also like to take a hat and pair of sunglasses with me because I'm the squintiest person alive and can't handle having sun in my eyes, and shade is sometimes hard to find. Another item that I think could be useful is the Elizabeth Arden 8 Hour Cream (£26.00) because as well as a lip balm, it can be used to soothe any pesky sunburns that you might get. The last item in this bunch is hair-related, and although this is more of a precautionary item, I think a good leave in conditioner in spray form can be very useful if sea water dries out your hair a lot. I'm going to be using this It's a 10 Miracle Leave-in Product ($18.00) after showers, but i'll also take it to the beach with me incase I feel like my hair needs a refresh. I'm not exactly sure if it's going to work that way, but we shall see. For body protection, I have two kinds of products depending on what I am doing. If I'm going to be doing water sports or something quite active, I'll probably use the Nivea Sun Protect & Refresh SPF 30 (£8.50) all over my body. I love that it's in spray form as I HATE applying cream sunblock, and it also makes it easier to reapply. I also have the Bioderma Photoderm Bronz SPF 50 (£21.90) for more of a lazy beach day, as it claims to protect yet still enhance a tan. For post-beach care, I'm taking this Nivea Sun Moisturizing After Sun Lotion (£5.00) to soothe and Rehydrate, and my Pink Wild and Breezy Body Spray (£8.00) so I can smell a bit nicer and less lotion-y. Hydrate, hydrate, hydrate. This is probably the most important thing to remember when going to the beach so you don't pass out of dehydration. Believe me, your body and even your skin will thank you for it. I usually like to pop a few bottles in the freezer the night before, and only take them out the second before heading out. That way they won't be boiling hot a few hours after you are at the beach. The worst feeling is being hot, sweaty and thirsty and only finding a bottle of hot water. I also do this for juice or any other kinds of drinks, it makes the perfect treat. The final thing I have is not an essential, but it's definitely a lot of fun. I'm a huge accessory gal, and I love wearing rings, earrings, necklaces and bracelets all the time. 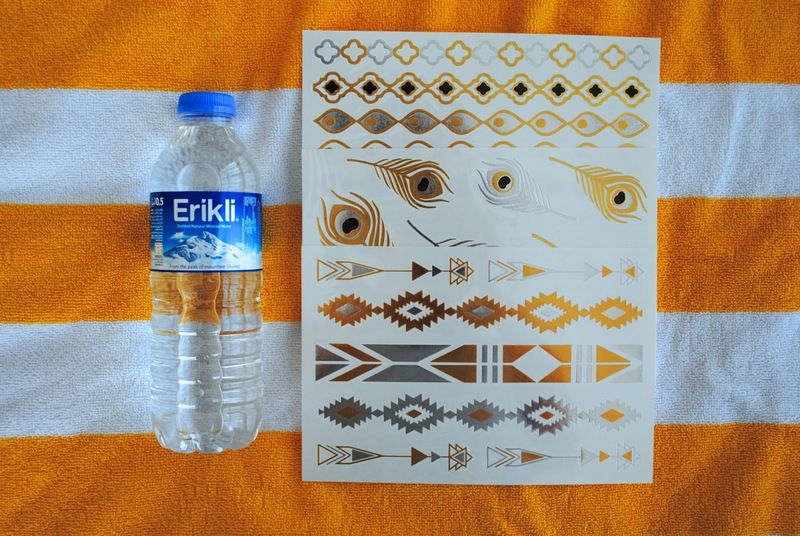 Of course, this can't really happen at the beach, so I though Flash Tattoos ($22.00) would make a great alternative as they give the same sort of effect. I'm basically planning on covering myself with as many of them as possible. I hope you liked reading about some of my beach essentials, and I'd love to hear what yours are in the comments below. I'm sorry to those who already have cold weather and hate me, except not really because I'm jealous and Autumn is my favorite season.